What one word would you use to describe Audi? Luxury? But of course. The interiors alone are award-winning and precedent-setting in many ways. Performance? Yes, yes, yes. Speedy, agile and strong acceleration are all terms readily applied to this German auto maker's products. But we have one more word that has described just about every Audi since the beginning: Beauty. Audi has, almost without exception, penned some of the most breathtaking designs on the automotive scene. 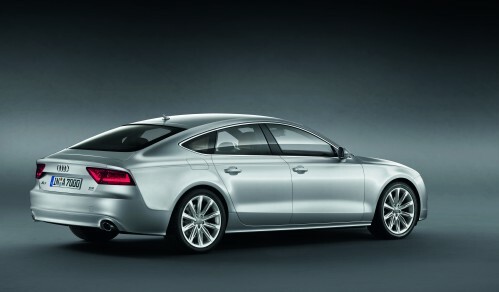 "Beauty" is a word you will read or hear often when it comes to Audi's 2011 products. A case in point is the all new A7, an all-wheel drive, five door hatchback coupe. We all know that five door coupes or "sedana coupes" have been around for a while. But the A7 is something else again. It advances the genre, which includes some pretty far out examples, further with classic, enduring lines. You won't find anything gimmicky or merely trendy here. Audi really thought this one out. We're told that a number of choices will be available to power the A7, including a supercharged 3.0-liter V6 producing 300 horsepower and 325 pound-feet of torque and a 3.0-liter turbodiesel V6 good for 245 hp and 500 lb-ft of torque. To get all that power to the pavement Audi's unveiling a seven-speed dual-clutch S tronic automated manual transmission. The A7 uses the same basic platform utilized by the A6 and the A8, and for as large as the car is, it reportedly is quite nimble and doesn't feel as though it needs to lose weight. That's largely because its body actually is heavily composed of aluminum, which reduces weight. In case you are wondering, the A7 is pretty useful and flexible, too. Without the rear seat down, there's about 18.9 cubic feet of space under the hatch, but if you lower the seat, the volume jumps to 49.09 cubic feet. We also know that those gorgeous LED headlights with light emitting diodes that have become partt of the "Audi face" are also the mix for the A7, but we're not sure if they will be standard or optional equipment. What we can't wait for is to get a look at athe interior. With any Audi, the interior is always an element that brings the buzz, and the company has long been considered a world class leader and innovator for interior design. An Audi news release says, "The sinewy sportiness of the exterior carries over into the interior of the A7, where Audi again demonstrates its leading role in automotive design. The salient element is the “wrap-around,” a horizontal line that encircles the driver and front-seat passenger in the interior to provide a feeling of safety and security. The wave-shaped application strip with its integrative dynamics is the salient element of the dashboard." The release adds, "The utmost care has been devoted to every last detail in the interior. Workmanship is at a craftsman’s level. 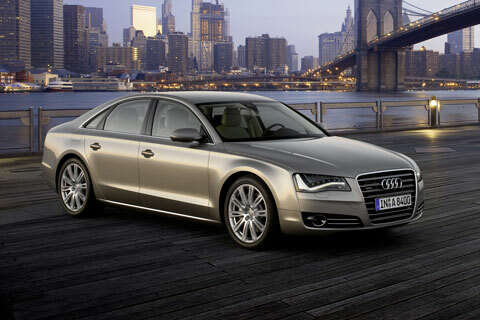 Optional climate-control and massage functions are available for the front seats covered in high-grade Audi leathers. The optional ambient lighting fills the entire interior with atmosphere." Like Audi’s A8 flagship, the A7 also combines a new level of technical intelligence with logical, intuitive ergonomics and self-explanatory operation. Look for Audi's MMI operating system to be included on the new A7, too. "The advanced MMI operating system with central menu button and reduced number of buttons comes standard, while one of the options is a new head-up display that projects the most important information on the windshield. The MMI touch system combines a hard drive navigation system with the convenience of touchpad input," the Audi news release says. "The driver can use the touchpad to perform numerous functions, such as using his or her finger to write the letters of the destination or the digits of the telephone number. The online services work together with Google to connect the five-door Audi coupe to the Internet via the Bluetooth car phone. A UMTS module delivers images and information from Google Earth to the monitor and combines them with the navigation route. A WLAN hotspot is used to connect mobile devices." We don't have any details on pricing, and published estimated are all over the place. Some say the price will be in the $60,000 range, others say base price may hit a lofty $80,000 or more. Nor do we have information on the fuel mileage ratings as of yet. A8 To quote singer Usher, " Oh, my gosh." What else can be said about the newest version of one of the world's most glamourous, most capable sedan? The A8 is a car whose charisma is only heightened by the fact that they are seen rarely in most locales, prompting even more head turning when they are spotted. Well, expect to see the necks swiveling like crazy this year. Audi’s truly worked magic with the styling of the new A8, managing to maintain continuity with the previous generations’ classic lines, while still breaking ground with interesting designs, surfaces and subtleties. The new 2011 A8 does keep the overall sense of fluidity and styling elements that are present in the car company’s current models from the A3 up, but it adds some features like the arresting front and rear ends, clearly the highlights of the exterior design. Thanks to lightbars that can be seen in several different themes, and taillights which, at least according to press materials, have at least three different variations to them, Audi has some distinctive trademarks that can’t be missed. They’re almost impossible to describe adequately—seeing is believing are the operable words here. Inside, Audi’s worked its usual interior magic, including graceful arced pieces of wood that are fitted to the rear of the front seats and which are aligned precisely with trim pieces along the door panels. Gorgeous unvarnished wood is seen everywhere, and matte and shiny black surfaces grace the turn signals and other controls. Shift gradients can be seen illuminated in the yacht style shift lever between the front seats. The central console is designed to be used in three zones, and as your wrist rests on the transmission shift lever, your hand is intended to be free to operate various controls. You’ll also notice gorgeous double stitching throughout the interior, along with headrests that appear to be two-tiered—an unusual arrangement. As you might expect, ambient light casts its soft glow at night throughout the interior, in color schemes of ruby, polar and ivory. Power for the new Audi A8 comes from a 372 horsepower V-8 which Audi officials say uses 15 percent less gasoline than previous engines for the model. There’s also an all-new electronically controlled, eight speed Tiptronic automatic transmission. By the way, you’ll be able to initiate gear changes with a mere tap on the lever, or using rocker switches on the steering wheel. It goes without saying that the A-8 has all-wheel drive Quattro for its owners. The new A8 is slated to go on sale this fall. As they say, " it's gonna cost ya." Look for price tags upwards of $80,000 or so--and worth every penny. A4 Arguably Audi's bread and butter line, the 2011 Audi A4 has modest changes since it's only in the second year or so of this generation's run. For starters there is a new eight speed automatic,nd a Nutmeg Laurel wood option replaces Birch wood trim. A reverse camera and parking sensors grace the 2011 A4. You can also get a modified titanum Sport packge that now includes black trim, and the Sport package now includes 19 inch wheels, blind-spot warning becomes a stand-alone option in its place. HD radio is now included with the Navigation package. Gas mileage ranges from about 18/27 to 23/30. Prices start at just under $33,000 and climb to about $49,000, base price. Standard equipment includes 17-inch alloy wheels, a sunroof (panoramic on Avant), cruise control, foglamps, automatic climate control, eight-way power front seats, a tilt-and-telescoping leather-wrapped steering wheel, leather upholstery, a dash-mounted Audi Multi Media Interface (MMI) and a 10-speaker sound system with a CD player, auxiliary audio jack and satellite radio. Options on the Premium include heated front seats, Bluetooth and an iPod interface. If you decide to spring for the Premium Plus you get even more goodies, including automatic bi-xenon headlights, LED running lights, automatic wipers, three-zone automatic climate control, an auto-dimming mirror and a better trip computer. TT Audi's TT has traditionally been one of the most beautiful designs in the sports car world. With its rounded body,dramatic front grille and luxurious appointments the TT matches its sporty performance with plenty of treats for the visual senses. That's no surprise because Audi's style sense and aesthetics usually run from the merely glamourous to drop dead gorgeous. And TT capably demonstrates the other quality that makes Audis so delectable: strong handling and acceleration. That's even more true for 2011 because the TT's biggest news is a new engine. It's a new 211 hp powerplant that puts out 258 lb-ft torque with the Audi Valvelift System. That compares to 200 horsepower and 207 pounds of torque for the current model. Fuel economy figures have not yet been released. Expect to spend between $39,000 to almost $50,000 for your new Audi depending upon the model of your choice.